Paramount’s sun-kissed lifeguards are suited and booted in the latest still to emerge from Seth Gordon’s Baywatch movie. 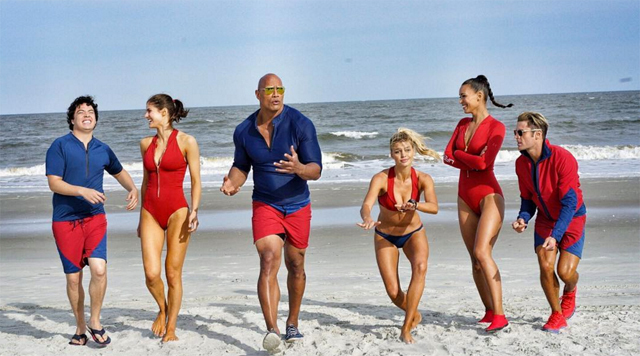 Continuing to shed light on production via his popular social channels, today’s action shot arrives by way of Dwayne Johnson, who headlines the studio’s reboot as grizzled veteran, Mitch Buchannon. Donning the iconic red swimsuit, Johnson’s lead will be flanked by Zac Efron (Matt Brody), Alexandra Daddario (Summer), Kelly Rohrbach (C.J. Parker), Ilfenesh Hadera (Stephanie Holden) and Jon Bass (Ronnie). Based on the wonderfully cheesy 1989 TV series of the same name, Paramount is pulling no punches in its bid to bring Baywatch to the big screen. Boasting an R-rating and a truly impressive cast list – Hannibal Buress and original star David Hasselhoff also feature – the studio’s starry actioner is riding the crest of a wave of goodwill, thanks in large part to Johnson’s steady stream of behind-the-scenes photos and casting announcements from the Miami set. Baywatch opens in theaters on May 19, 2017 opposite Warner Bros. and New Line’s horror follow-up, Annabelle 2.